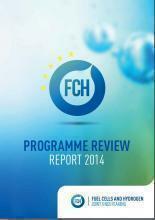 The 2014 Review is the fourth review of the FCH JU project portfolio. The reviews began in 2011, following a recommendation arising from the interim evaluation of the FCH JU which identified the need to ensure that the FCH JU project portfolio as a whole fulfilled the objectives of the MAIP, which subsequently became the MAWP. • The portfolio’s effectiveness in promoting linkages and co-operation between projects, and between FCH JU-supported projects and those supported by other European instruments, the Member States and internationally. Review panels The 2014 review comprised six panels covering a total of 114 projects. Each panel covered between 10 and 24 projects, as shown in Table 1 below. The objective was to assess projects within each panel as a sub-portfolio (within the FCH JU portfolio) and not as individual projects, although examples of individual projects representing good practice were highlighted.